My sister Barbara and I were in Puebla, Mexico recently and during our three-day stay we ate at El Mural de los Poblanos Restaurant three times. We can’t get enough of Chef Lizette Galicia’s good food. We each have a favorite salad there. Barbara loves the fresh nopal cactus tossed with tomato, onion, cilantro, queso fresco, radishes and little slices of fresh serrano chiles. I love the sunflower sprout salad tossed with toasted pecans, sunflower seeds, radishes and a light olive oil and lime dressing. Everything goes crunch. Be patient. There is a recipe and photos below! This week I bought three nopal cactus paddles at my organic market, spines and all. I buy them in the Teotitlan del Valle market already trimmed, diced and waiting to be cooking. Those spines pricked me in the market and the check-out clerk had to cover her hand in a plastic baggie. Today, I put on my thick rubber dishwashing gloves to handle them. It was much easier than I thought. With paring knife in hand, I scraped off the spines and trimmed the edges. Facile. 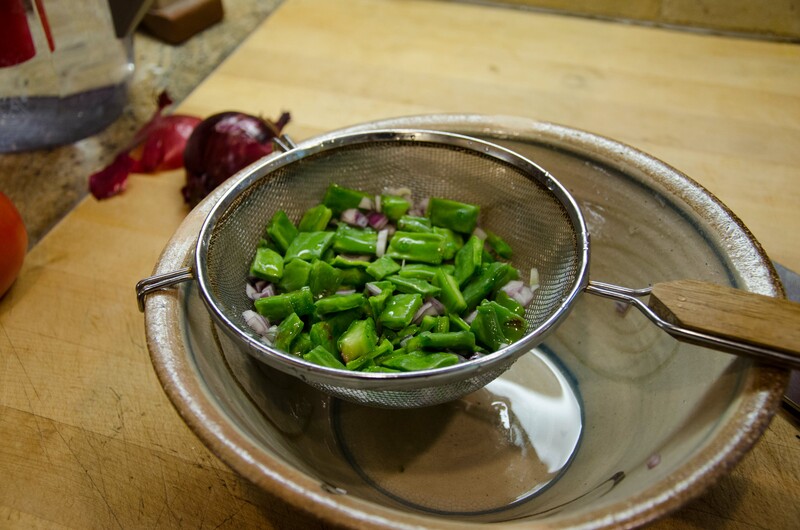 Based on the ingredients in my kitchen and Chef Lizette’s method for preparing perfectly crunchy, delicious nopal, here is my recipe I know you will find tasty. 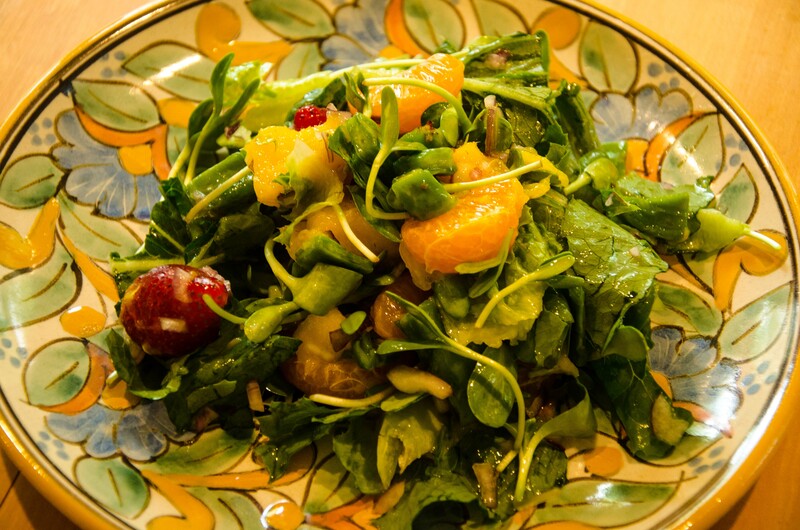 It is a merging of these two salads we love, a blend of nopal and sunflower sprouts. Clean the cactus paddles. Here is a link to how to do it. Put the diced cactus in a small bowl. You should have about 3/4 to 1 cup. Add coarse sea salt. Stir. Let sit for 10 minutes. Add the diced red onion to the cactus. Stir. Let mixture sit while you prepare the other ingredients. Wash and dry lettuce and sprouts. Put into mixing bowl. Soak berries in water for 2 minutes with 1 T. of white vinegar to clean. Drain. Dry. De-stem. Add to salad. Add mandarin segments to salad. 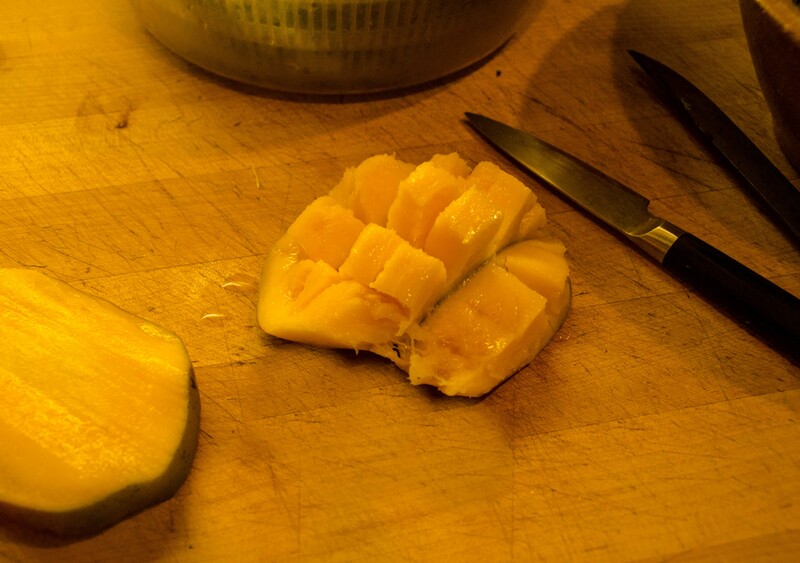 Prepare mango by cutting it in half along the seed plane. Score each half as if it was a tic-tac-toe board in 1″ cubes. Fold the skin under and peel flesh from skin with paring knife. Add to salad. Go back to nopal cactus and onion mixture. 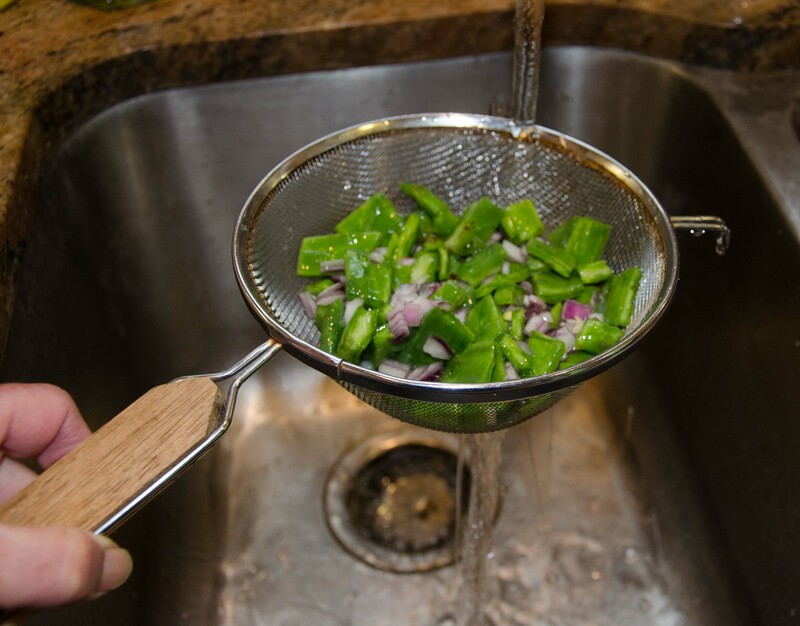 Turn out into a mesh strainer. The mix will be slimy like okra. Run under cold water for 5 minutes or until the water is clear. Taste for saltiness. If too salty, continue to rinse. 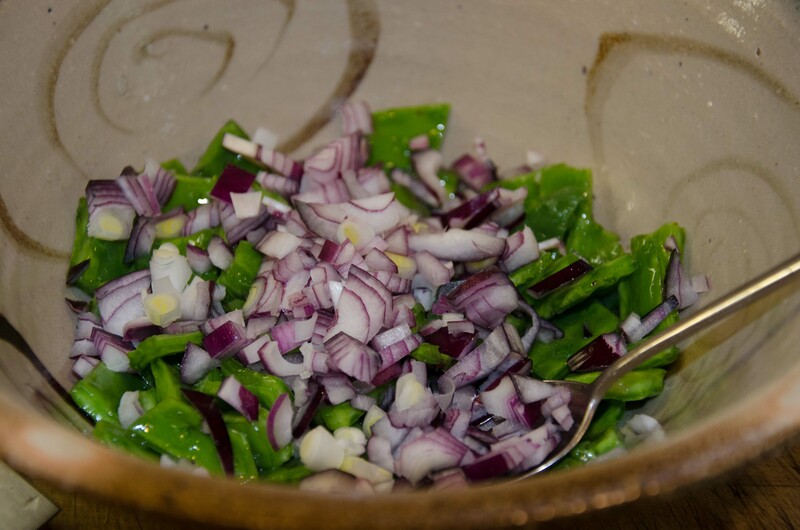 Drain cactus and onion well over a bowl. Put bowl in refrigerator for 10 minutes until mix is cold. Add to salad. 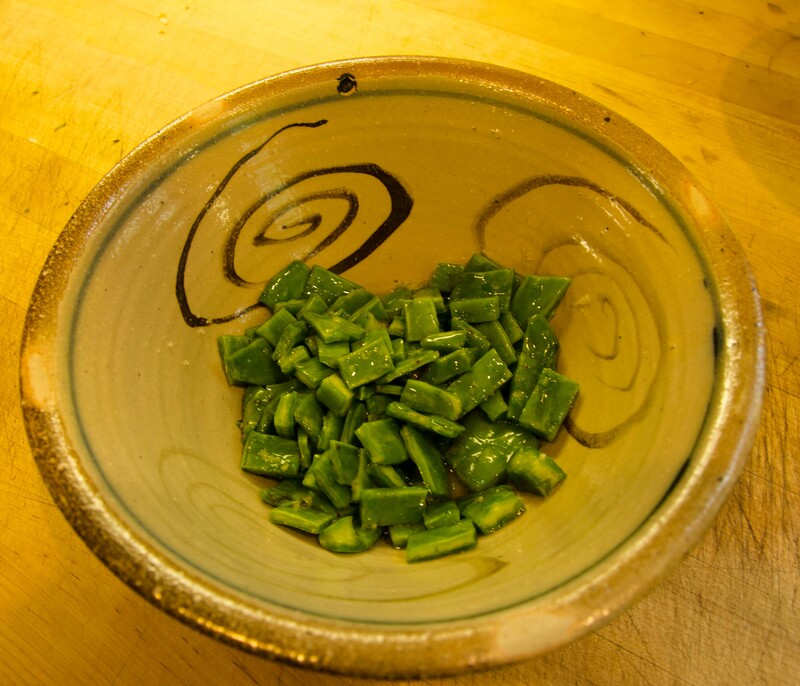 Toss salad well with sunflower seeds. Dress and serve. I am planning to make this again next weekend for the TMM-Day of the Dead Photography Workshop 2012 Reunion. I’ll be writing more about that. Suffice it to say, seven women in the workshop last fall connected and wanted to get together again. They are coming to North Carolina from all over the U.S. This entry was posted in Dining and Lodging, Oaxaca Mexico art and culture and tagged cactus, cooking, diabetes, eating, food, Mexico, nopal, nutrition, Oaxaca, recipes, restaurants, salad. Bookmark the permalink. This looks delicious. 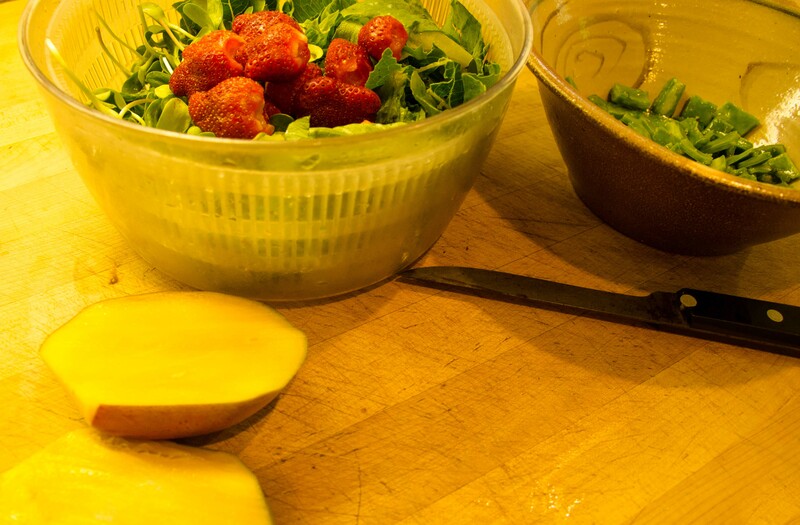 I’m going to try this salad in the late spring, when my strawberries begin to ripen. Beautiful presentation and pictures and a great explanation of the procedure. Thank you for posting it. You are very welcome! You don’t have to wait, though. Try it with orange or grapefruit sections cut up, or apples and pears. Then, do it again in the spring with berries!